Plywood is engineered wood made by gluing several thin sheets of wood together with wood grains running alternately along the sheet and across it. 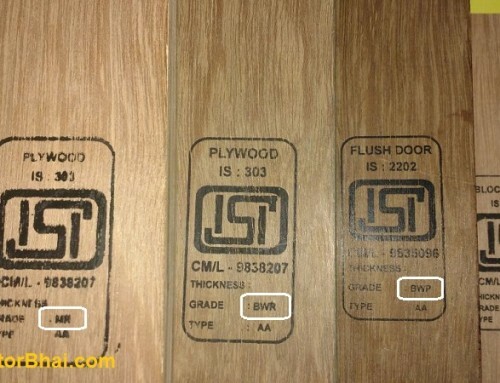 Plywood you can say is a substitute to natural wood. Plywood is used in areas where actual wood or natural wood cannot be used entirely in given space. Another reason for using plywood instead of natural wood or plain wood is its resistance to cracking, shrinkage and stability. •	Firstly the logs are cut of a given tree species in desired length. 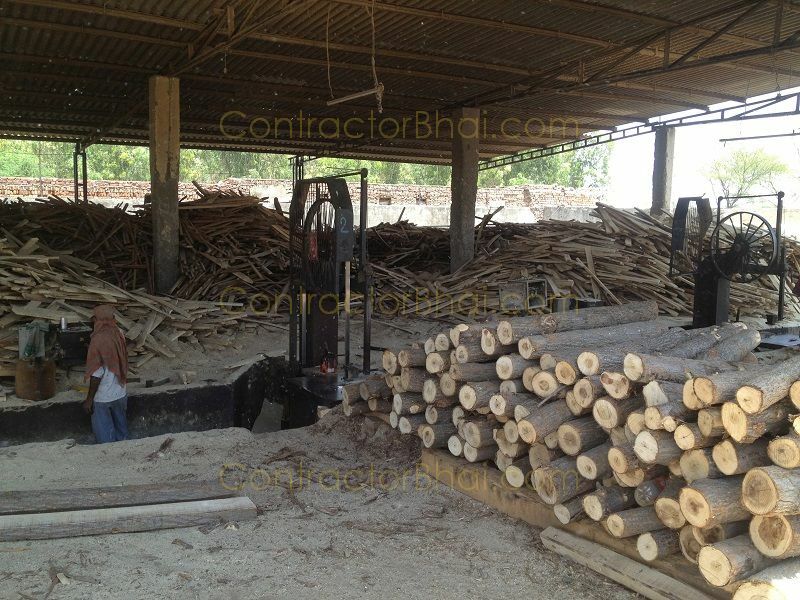 •	These logs are then placed on debarking machine where the machine removes the bark with a sharp toothed grinding wheels or high pressure water jets. During this process the log is slowly rotating along its axis. •	These debarked logs are then put on a chain conveyor where huge circular saw slices them in about 8 feet 6 inches length, appropriate for making a standard 8 feet sheet. These are known as peeler blocks. •	Veneer are then made to form plywood. 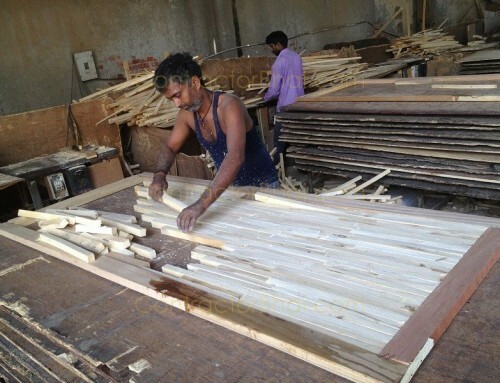 But before veneer is cut, the peeler blocks are soaked in high temperature solution to soften the wood. This is done for 12-36 hours depending on type of wood and the diameter of the block. •	The soaked peeler blocks are then sent to peeler lathe. Here the blocks get aligned automatically and are fed into the lathe. Lathe is a machine used for shaping wood. As the lathe rotates the block swiftly along its axis, a full length blade peels a continuous sheet of veneer. The block is peeled until the diameter is reduced to 3-4 inches. The remaining piece of wood is thrown out form the lathe and a new peeler block is fed in. •	The veneer sheet obtained is either sent for further processing or stored in form of rolls or in long trays.Usually veneer are sent for further processes where it is cut in 4 feet 6 inches sheet for making a standard 4 feet plywood sheet.During this process, sheets with defect or that are unacceptable are sheared out. •	Veneers are then sorted and stacked as per its design and grade. This is either done manually or automatically using optical scanners. •	The sorted veneers are then fed into a dryer to reduce its moisture content allowing it to shrink before gluing it to form a plywood. •	The dried veneers are sorted and stacked once again as per its grade and design. Under width sections have additional veneer fused on with tape or glue to make pieces suitable for use in the interior layers where appearance and strength are less important. 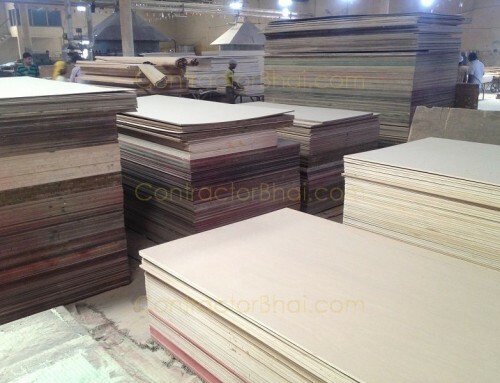 •	Once suitable veneer sections are amassed for a plywood, it is laid up and glued together to make plywood. This could be a manual or semi-automatic process. For 3 ply sheets for example, the back veneer is laid flat and is run through a glue spreader that applies a layer of glue. The short sections of core veneer are then laid crossways or perpendicular on top of the glues back. This whole sheet is then run through the glue spreader again. Finally the face veneer is laid on top of the glues core. The sheet is then stacked with other sheets waiting to go into the press. •	The glued sheets are loaded into a multiple-opening hot press. When all the sheets areloaded, the machine squeezes them together under high pressure and at the same time they were heated under very high temperature like 110- 150 degree Celsius. •	These sheets then pass through a cutting machine where trimming takes places. The sheets are cut to final required width and length. Higher grade sheets are passes through a set of 4 feet wide belt sanders that sand both the face and back of the sheet. Intermediate grade sheets are manually sanded to clean up rough areas. Some sheets are run through a set of circular saw blades that cut light indentations in the face to give the plywood a textured appearance. •	The finished sheets are finally stamped with a trademark that gives the buyer complete information of the plywood like its grade, mill details, etc. The face in above point means the visible design surface of the plywood. Face of plywood is not same as the panel and core neither does it belong to the same specie to that of panel and core. There are different types of face like Gurjan, etc. Therefore if you see, plywood is composition of panel and core glued alternately and finally a face. 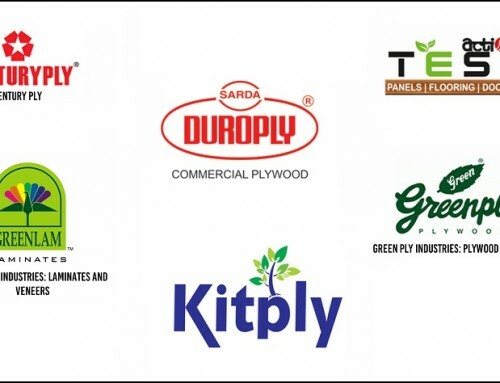 The face of plywood is an essential feature of plywood especially in India where home owners believe that plywood shall appear elegant when used. 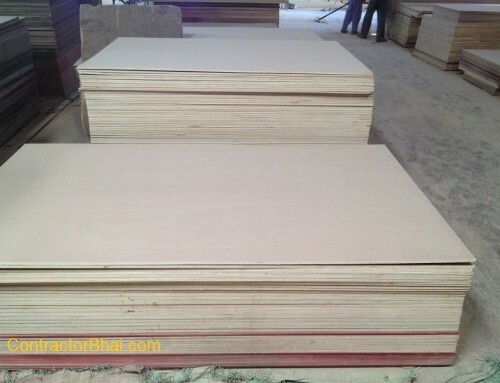 Plywood is used to make variety of products like sheds, to cladding to any type of furniture, beds,etc. It is graded on the quality, from class A to class D, A being the best quality and D being the worst quality. 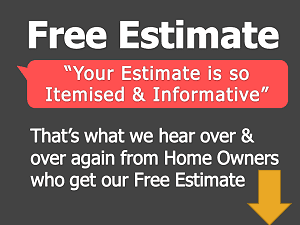 I must appreciate your knowledge in this area and your ability to articulate the topics in simple language. I think if you can put more picture for the details provided, would help the reader a lot. Reader like me will read first line, and last line and look for picture ;-).